Scenario: I got a late start due to rain in the morning, so Ann and I rushed everything together and shoved off from the Jacksonville free dock on Sister’s Creek headed to Fernandina. I had just downloaded a new iPad navigation app but with no routes. I knew that the passage through the Fernandina shallows was difficult due to all the unmarked shoals so I opened Waterway Explorer with Safari on my iPad and searched for Fernandina. Two Nav Alerts came up. I chose one and saw a route available for download in GPX format. I tapped on the route, which then gave me the choice of which app to use and voila! I had a route to follow with 14 MLLW! Fernandina was a piece of cake after that. Along the way I saw a sailboat in the famous shoal by R2 and another one that ignored G1A and G1B that was also aground. I had no problem. The cost of the app was peanuts compared to a tow. Review: I evaluated 14 apps that can be used in the scenario presented above. Compared to a tow, they are cheap, especially if you already own an iPad or iPhone. Depending on the situation, the cost of a tow could pay for the mobile devices and the app, combined. 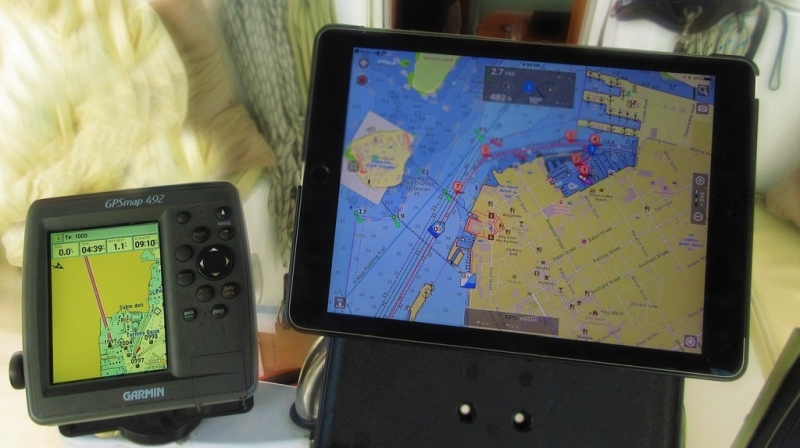 Apple’s iPad has been a disrupting force in marine navigation. iPad and mobile apps have steadily gained capabilities with some offering most of the same features as dedicated chartplotters. There are also apps produced by chartplotter manufacturers that are not designed as replacements, but rather are intended to assist in viewing or managing the chartplotter. In this article, I focus on those apps that can fulfill the function of a chartplotter at the helm. I have also included a couple of “helper” apps that warrant review. I purchased 14 mobile navigation apps and installed all of them on my iPad Air 2. I then compiled a list of features, including all those listed by the app developers. There are also apps that will run on Android devices, but there aren’t as many choices on that platform. Location plotted on a chart: This is the most basic of functions, often with choices of north up or heads up with a chart for your location. Route and waypoint management: Such data should be easily created within the app with full editing capabilities. Routes and waypoints must be easily exported and imported between apps, cloud storage, email, etc. Boat parameters: Boat speed, ETA to a destination if you’re on a route, and other parameters are often included such as fuel used, distance traveled, cross-track error, etc. 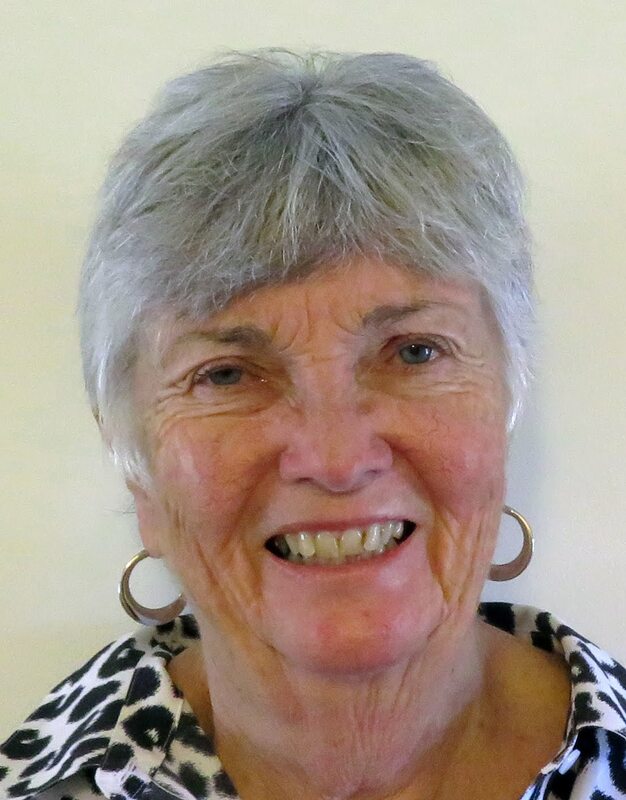 Active Captain: It’s like the old Citizens Band (CB) radios in cars. Anyone can contribute to the conversation or announce what they encounter. If an app incorporates Active Captain posts, then you have the option of reading what others say about hazards, marinas, navigation, anchorages or other information. I consider it important for a navigation app used by cruisers. Tides and Currents: You always want to know the tides and currents while cruising. Having that information inside the app and displayed by a clickable icon is more convenient than accessing the internet. With in-app capability you can find the results for any date or time, even when out of range of WiFi. So, there you have it, the bare-bones list of requirements that I think are important for a navigation app. When compiled, the list of these features and those offered by all the apps total 82 entries! The attached spreadsheet shows the features and capabilities of each app. Even then, the list is not exhaustive. There are many nuances in my simple list above that make all the difference between an app that’s easy to use and informative and one that has a long learning curve. Using the spreadsheet, you can decide what meets your needs. Price: This comes in two flavors. In one case it may be free, but you have to buy the charts. In the other case you buy the app and the charts are free. Apple is in the process of changing their store, so each manufacturer will have just one app but with choices within the app to buy different charts. Charts Offered: They can be raster or electronic. The raster charts look just like paper charts based on NOAA RNC (Raster Navigation Charts) and the electronic charts are based on the NOAA ENC (Electronic Navigation Charts) charts. In the last two years, ENC charts have come into their own. Most of the chart manufacturers’ own charts now look almost identical to the ENC charts. The type you prefer is a personal choice although I prefer the electronic version for readability when under way due to text rotation and the additional information available after a click or tap on a chart feature such as a buoy or restricted area. App Memory Requirement in GB with US Charts: The size at least includes the charts of the entire east coast of the US but not Canada or the Bahamas and is stated in gigabytes (1000’s of megabytes). The main differences in storage requirements come from the additional detail included in some chart packages like terrain or road mapping near the navigable waters. Navionics has additional storage requirements due to their SonarCharts. Additional Charts: All apps offer Canada and most offer worldwide charts for additional purchase. Quilted: This feature started with scans of paper charts. It was an enhancement, so the chart as displayed on the chartplotter or PC looked like one huge chart for your area without having to skip between charts as your boat moved along. With electronic charts, it became a non-issue since all manufacturers’ versions are seamless. Interestingly, there are still a few apps using RNC that do not quilt and require the loading of the next chart when you navigate off the chart edge (Not quilted: iNavX and Great Depths). North Up, Heading Up: All offer north up but not all offer heading up (No heading up: iSailGPS and Great Depths). Buoy Numbers Shown on Chart: This is only a factor for electronic charts since raster scanned chats all have buoy numbers. Most provide this feature but two don’t (Garmin Active Captain and SeaNav). I don’t want an app that doesn’t show buoy numbers right on the chart. Of course, if you tap the buoy you will get an additional detail popup but that’s dangerous, in my view, when you are navigating through an inlet with current and no time to spare. Weather Shown on Chart: This requires an internet connection and I don’t see a lot of value in it since there are so many good weather apps that do a better job. Number of Depth Shadings: When navigating a channel, it’s useful for the different depth ranges to be shown in various shades of blue with the shallowest area being the darkest blue. With this feature, you can tell at a glance if you’re in safe water. Most apps allow you to specify the “danger depth” as the darkest color to fit the draft of your boat. Selectable Route/Track Line Thickness and Color: I prefer very thin lines, so chart information is not obscured and different colors for different routes. For example, I may start out from Cape May but have two routes, one to Chesapeake City and a shorter one to Cohansey Island if the weather kicks up. Two different colors keep the routes separate where they are close together at the start. The apps with this feature are AquaMap, iNavX, Max Sea TZ, and Pro Charts. Selectable Waypoint Symbols: It’s just another convenience to use a different symbol for an anchorage vs one in the middle of a route. Apps include AquaMap, Garmin AC, iNavX, MaxSea TZ, and iSailGPS. Selectable Units: All apps allow you to change navigation units. Boat Speed: All apps except one show boat speed. The Garmin AC seems to require a chartplotter to output boat speed by mirroring the chartplotter data output. Chart Update Frequency: Most are once per year, some are more often, and some are on demand directly from the NOAA chart site. If not stated, the updates are once per year. AquaMap updates every three months. Navionics has an update on-demand button, but it doesn’t seem to change the stored NOAA ENC charts or the Navionics+ charts frequently. For example, the ICW just north of Beaufort, NC, where the channel to Beaufort splits off of the ICW, was re-buoyed in June of 2017 and yet the Navionics+ chart is still not updated as of 2/14/2018. The NOAA RNC (raster) and ENC (electronic) charts have been updated for months on the NOAA site. It appears the updates mainly affect the SonarChart in the Navionics app. Apps that sync to the NOAA site on demand are iNavX (RNC), Pro Charts and SEAiq. NOAA publishes new updates to their site every 7 days. Draw Your Own Charts: Only Navionics allows chart creation on an iPad with a compatible sounder. Garmin has a similar feature, but it requires a chartplotter to see the data. Satellite View Overlay: It’s a handy feature when looking for a sandy beach for your dog or for getting the layout of a marina before coming in. It requires an internet connection. Satellite views are offered by AquaMap, iNavX, Max Sea TZ, Pro Charts, Plan2Nav C-Map, and Great Depths. Active Captain: Having access to Active Captain information is a must for me to be up-to-date on what others are reporting about the conditions of the shallows. It’s also helpful in choosing a marina. When offered by an app, the Active Captain information is stored on your mobile device or tablet and, therefore, does not require cell service or internet to access. Active Captain is currently available on Garmin Active Captain, Navimatics Charts and Tides, AquaMap, and SEAiq. ETA to Destination: All apps provide this basic information except Garmin AC (when not paired with one of their chartplotters), Navimatics, and Great Depths. ETA to Each Waypoint in a Route: Why would you want it? Well, when running the ICW you might want to know how you’re doing at the Surf City bridge for their once-per-hour opening? Are you going to make it? Do you need to speed up or should you slow down so you won’t have to spin donuts in a narrow channel by the bridge. If you have a waypoint on the bridge, you’ll know the information you need. By the way, it’s never the next waypoint since the ICW is not straight; it’s usually the 4th, or 10th, or so waypoint that you’re interested in. Only two apps provide this information for a route: AquaMap and iSail GPS. Bow Line: Strangely, there’s one app that does not draw a line out from the bow in the direction of travel (Garmin AC). It’s much easier to steer the boat if you have help from a bow line pointing the way. Dock-to-Dock Autorouting: I’m not sure I’m ready for this but Navionics offers this feature in their app. In Navionics, you can manually make your own route or use the autorouting feature, but you cannot import or export a route, so it cannot function as a stand-alone chartplotter. You can, however, import and export routes through a compatible chartplotter they support. Direct Route Importing w/o PC: This uses the iPad’s “Open In” option which is very handy. Apps with this function: AquaMap, I-Boating, SEAiq, and iSailGPS. Direct Route Exporting w/o PC: With this option you can share routes between apps on your iPad or with a cloud service. Apps with this function: AquaMap, SEAiq, and iSailGPS. Send Routes via Email: You can send your friends a route you followed. Apps that do this: AquaMap, iNavX, SEAiq, SeaNav, and iSailGPS. Export Routes to Google Earth: This requires access to a KML or KMZ export format. This can be useful at times to scope out shallow areas. Apps with this function: AquaMap, iNavX, and SeaNav. In-App Tides and Currents: Some apps require an internet access and some even put you through a long menu to find the tide station you’re interested in. Some even require you to purchase a second app just for tides and currents. I much prefer the tides and currents to be calculated by the app with no internet connection required, it’s faster too. Most apps, but not all, allow you to slide the time scale to see tides and currents at any time and for any date. Apps with tides and currents without the internet and without buying another app are Garmin AC, AquaMap, Navionics, Navimatics, and SeaNav. Tide Icon Shows Height of Tide: Some apps just have a “T” for a tide station and then you click or tap on the icon to get more information. That’s fine, but I prefer the tide icon to also include a small graphic showing the tide height with a number. One app even shows whether the tide is increasing or decreasing. 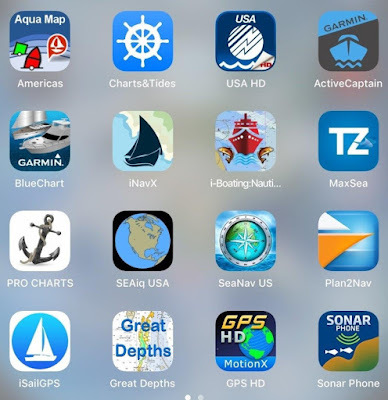 Apps with a tide height icon: Garmin AC, Navionics, Navmatics, and AquaMap. Apps with a tide height and a number showing the tide level: Navionics, Navmatics, and AquaMap. Additionally, the AquaMap icon shows whether the tide is going up or down. Current Icon Shows Direction: The current icon is usually a small arrow. Additional information can be provided by having a small number show the speed of the current. Apps with this feature: Navionics, Navimatics, and AquaMap. Additionally, an icon may show whether the current is increasing or decreasing, AquaMap does this. Some apps mix currents at the surface with currents at some depth that may interest big ships. Only AquaMap differentiates between the two types of current stations. Whenever you see opposing currents (e.g., East River of NYC) you can bet that one station is not on the surface. The AquaMap current icon is faded to show underwater current and the detail chart gives the depth. Using the Internet: Ship positions can be picked up by stations located near shipping lanes and uploaded to certain internet sites. Some apps can access this data and display AIS positions on the chart, but it requires an internet connection. Apps with this capability are iNavX, SEAiq, and SeaNav. Using WiFi Capable AIS Receiver: The other option is to have an AIS receiver that outputs a WiFi signal to be picked up by the iPad and used by the app to display AIS signals nearby. Apps with this option are: Navimatics, iNavX, I-Boating, Max Sea TZ, SEAiq, and SeaNav. Selectable AIS Vector Length: Choose the length in feet or nautical miles of a line from the target’s bow. MaxSea TZ provides this feature. Selectable AIS Vector Time: This is my favorite. If both the boat and AIS target are set to draw a line 10 minutes long (the length then varies by speed), then it’s easy to see if a collision is in your future. MaxSea TZ lets you select the vector length based on where the target will be in a number of minutes. Instruments: Now you’re getting fancy. Some apps will show all the instruments on board provided there’s interface electronics that the app is happy with (more cost). Apps with this option: iNavX, I-Boating, SEAiq, and SeaNav. Boat Data: This includes length, speed, draft, air draft, AIS location on boat and rate of fuel consumption. The last number can be used by the routing tool to estimate fuel usage for a route and to keep track of usage as you progress. Apps with boat data: Navimatics, AquaMap (some), I-Boating (some), and Max Sea TZ (some). Photos: Some apps will allow photos taken with the iPad (or iPhone) to be tied to your track and will show an icon on the chart where the photo was taken. Click or tap on the photo icon and up comes the photo. Apps offering this: AquaMap, iNavX, Max Sea TZ, and SeaNav. Such a route with photos can be exported so others can see the photos and where they were taken if the app supports KML files. There are more features in the spreadsheet that I didn’t list here due to space. Look at the spreadsheet for more detail. By now your head may be spinning – all the choices! I will start with the bare-bones outline I first gave at the beginning of this article and list the apps that fit and then expand the choices with more features. Bare-bones: Location, Routes/Waypoints, Active Captain, and Tides and Currents. AquaMap: US NOAA ENC charts for $19.99, with forever updates. Navimatics Charts and Tides: US ENC charts for $24.99 but no new charts since 2016. SEAiq: The use of NOAA ENC charts for US cost $49.99. The professional version of this app is used by major ship captains. It’s very complete with many, many features and will take some time to learn. The charts can be updated every 7 days, which is the NOAA update cycle. Bare-Bones Plus: Buoys numbered and direct route/waypoint import/export capability. The direct method uses the iPad’s “Open In” dialog and makes moving of data much easier between other apps and the cloud. Also, having buoys numbered on the chart is a personal favorite. AquaMap: You can move data with “Open In”, email attachment, iCloud, or the apps own cloud storage. All buoys are numbered on the displayed chart. SEAiq: Both AquaMap and SEAiq also support KML format for display on Google Earth and in other apps supporting the format. AquaMap: All the tides and current predictions are calculated within the app, no internet needed. Additionally, the icons on the chart show height of the tides and the direction and amount of current. Tapping on an icon shows more detail including the rise and set times of the sun and moon. The display has a slider for finding the exact tide or current at a specific time. Finally, all the tide and current icons on the chart can be varied in sync with a second slider, which can be handy for seeing what happens over the next few hours going up Delaware Bay. iNavX: This is the only app, to date, that offers access to the Waterway Guide list of Alerts, Marinas and Anchorages. More data overlays are coming soon to both iNavX and other apps. Nav App with AIS: This comes in two flavors: in one option the AIS signal is collected over an internet connection from a central website and in the other option the AIS data is captured via WiFi from a WiFi capable AIS receiver on board. Navimatics Chats and Tides: WiFi from boat’s AIS receiver. i-Boating: Only with a WiFi AIS receiver. Max Sea TZ: Only with a WiFi AIS receiver. I am including the spreadsheet of all 82 features so you can do your own selection based on what’s important to you and create your own list. You will have to download the file into Excel to see the comments in the cells marked in yellow. Each app name is an active link that brings up the Apple apps page for ordering. Perhaps you don’t care about Active Captain or other features I favor. If so, your selection criteria will be broader, and your app choice will be different. I have to admit that this was a difficult project to undertake and I’m a little leery that there may be mistakes in some of the yes/no boxes on the features, but I’ve checked to the best of my ability and if anyone sees mistakes, please send me an email and I will correct the spreadsheet and issue an update. So, what do I use at the helm? Now it’s AquaMap since it has all the features I consider important, and I also use Navionics for their SonarChart feature, which is unique among the apps. It helps navigate some of the shallows of the ICW, but you must be careful in some shallow areas when you see contour lines showing wide swings in depth. It’s an indication that the contour lines may not be correct, and you should proceed with an extra measure of caution. I also use SEAiq from time to time just to be sure I have absolutely the latest NOAA ENC chart for a particular location. Lastly, for another view of the latest chart I check Waterway Guide’s online Waterway Explorer since they download the latest NOAA RNC (raster chart) daily. AquaMap is no slouch with updates four times a year, which is more often than most apps, and the updates are free for life if you buy the “forever” charts. Here’s the link. You can let the slideshow play or go between slides with the arrow keys on your PC or swipe on the iPad. Let me know what you think of this assessment. I may have missed something. Sailing is a lifelong learning experience and I intend to keep learning for a long time to come. For instructions on how to download and manage GPX files, use this link: GPX File Use.